HRA News Agency – Behzad Zabihi, a Baha’i citizen sentenced on charges of propaganda against the regime, has been released from Sari prison after the completion of his six-month sentence. Mr. Zabihi has endured systematic harassment by intelligence agencies and multiple detentions over the past five years due to reasons related to his religious beliefs. According to the HRANA, the news organization of the human rights activists in Iran, Behzad Zabihi was arrested on September 04, 2017. 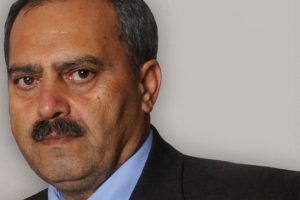 He was convicted by the first branch of the Sari City Court on charges of propaganda against the regime, and sentenced to a one-year prison sentence plus two years of exile to the city of Harris in Western Azerbaijan. A later ruling by the appeals court reduced his sentence to six months in prison. This prisoner of conscience was released from Sari Prison today and was received by friends and acquaintances. Mr. Zabihi has been repeatedly harassed by intelligence agencies and been arrested four times over the past five years, solely because of his religious beliefs. 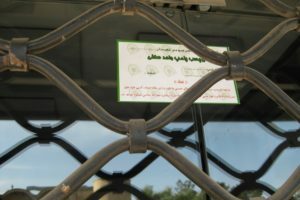 Following each arrest, Mr. Zabihi’s place of business has been subject to illegal forced closure and seal by the Ministry of Intelligence on multiple occasions. At this time the business continues to remain under the seal of government closure despite his family’s attempts to seek remedy through authorities. Baha’i citizens in Iran are systematically denied freedom of religious belief despite Article 18 of the Universal Declaration of Human Rights and Article 18 of the International Covenant on Civil and Political Rights. According to unofficial sources in Iran, there are more than three hundred thousand adherents of the Baha’i Faith. The Iranian constitution recognizes only Islam, Christianity, Judaism and Zoroastrianism. 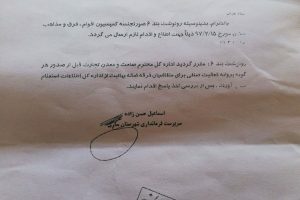 This exclusion is used as justification for the violation of the civil rights of Iranian Baha’i Citizens.